In medical history, measles was 1st identified as a unique disease by the Persian physician Rhazes in the 9th century when he published the text titled The Book of Smallpox and Measles. Measles is an ancient disease that used to have a profound global impact causing hundreds of thousands of deaths and millions of cases each year. In the 16th century, a measles epidemic caused the deaths of two-thirds of the population of Cuba in one year, and two years later, it killed half the population of Honduras. In the 1850’s, a measles outbreak caused the death of 20% of the population of Hawaii. From 1840-1990, it is estimated that measles has killed approximately 200 million people worldwide. In the decade before 1963 when a vaccine became available, nearly all children got measles by the time they were 15 years of age. It is estimated 3 to 4 million people in the United States were infected each year. Also each year an estimated 400 to 500 people died, 48,000 were hospitalized, and 4,000 suffered encephalitis (swelling of the brain) from measles. The introduction of the measles vaccine was one of the most important public health interventions in the past century. John Enders and colleagues used the Edmonston-B strain of measles virus to create a vaccine in 1963. In 1968, Maurice Hilleman and colleagues developed an improved and even weaker measles vaccine, the Edmonston-Enders strain, that has been the only measles vaccine used in the US since 1968. 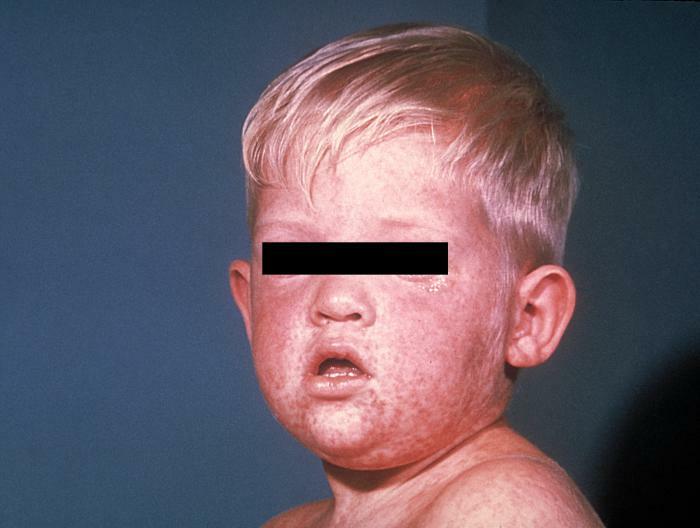 The CDC set an ambitious goal in 1978 to eradicate measles in the United States by 1982. By 1981, the incidence of reported measles cases was reduced by 80% compared to 1980. Even though the complete eradication was not achieved by 1982, widespread coverage of the measles vaccine dramatically reduced measles cases and measles-related complications and deaths. In 2000, the US had no continuous transmission of measles disease for more than 12 months, and measles was declared eliminated in the US. The recent measles epidemic sweeping the US that began from exposures to non-vaccinated children in Disneyland highlights multiple public health issues. Collective Public Health Protections: Public health differs from patient health because these are measures and interventions to protect us collectively. We live in a society that is becoming more and more interconnected each day, from the internet to air travel. In addition, many of us live and work in densely populated, urban areas. We do things on a daily basis to protect ourselves, our families, our friends, and our communities: wearing seat belts, stopping at red lights, not polluting public water supplies, not smoking in office buildings, washing our hands… Vaccines not only protect us and our children, but they also protect those of us in our communities who are vulnerable to diseases (children under 1 year, immuno-compromised people like cancer patients, pregnant women, elderly). By collectively immunizing and protecting the vast majority of the community, we create a defensive barrier when diseases are reintroduced into our communities (such as international visitors to theme parks like Disneyland or US travelers who visit other countries and return home with diseases). This collective protection is also known as “Herd Immunity,” and it serves as a powerful public health defense mechanism. This week in San Francisco, tens of thousands of public commuters on the BART train system were exposed to a person with measles. Let’s hope most of them were vaccinated and can collectively protect the region from more widespread measles outbreaks. During 2000-2013, measles vaccination prevented an estimated 15.6 million deaths making measles vaccine one of the best buys in public health. People have a higher likelihood of severe pneumonia, hearing loss, brain swelling or death from measles than having a complication from the measles vaccine. The reported “link” between the measles vaccine and autism comes from a report in the February 28, 1998 issue of the journal Lancet. The report has now been shown to be fraudulent and and the article has been retracted by the Lancet. Subsequently, 14 different studies evaluating millions of children in multiple countries show no difference in autism rates between those children who received the measles vaccine and those who did not. Politics: Public health should be separated from politics because illness and injury do not distinguish between liberal or conservative lives. Unfortunately, some politicians are trying to use the current measles epidemic and ignorance about vaccines for self-serving, political purposes. These politicians are trying to tie refusal to vaccinate with personal choice. The problem is that parents who refuse to vaccinate are not making a personal choice but instead are imposing their dangerous choices upon vulnerable infants and children. At minimum, these are decisions of neglect, and if their children were to become infected with measles and have complications or die, then these are decisions of harm. Parents have a responsibility to protect their children (placing them in car seats, keeping them away from matches, not allowing them to fall or drown…), and vaccines are one of the simplest and most protective choices they can provide their kids. If parents make poor or harmful choices on behalf of their children, legal, not political, implications can occur. We should not be making the current measles epidemic about political consequences, but we should be elevating the discussion to public health protections and saving our children and vulnerable populations from unnecessary illnesses or deaths. Report written by Bobby Kapur, M.D., M.P.H. Reducing Mortality in the Opioid Epidemic: What is Miami Doing Differently from the Rest of Florida and the US? Gun Violence: A Public Health Epidemic?